Hi friends! 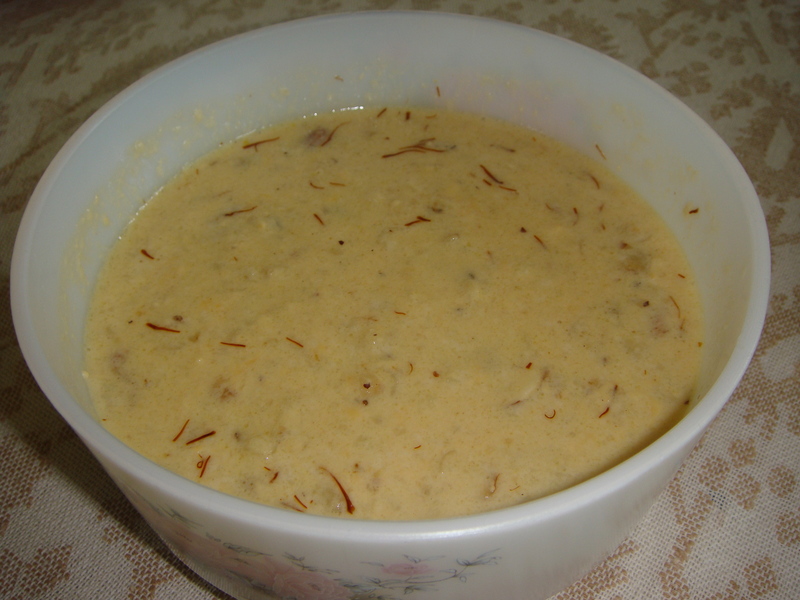 Makhana kheer is a delicious desert. Makhanas/Fox nuts/Lotus seeds are puffed lotus seeds and are used in making several dishes and snacks. In Northern India Makhanas are often used for snack. Makhana kheer is very easy to make and you can enjoy it as a dessert. In a heavy bottom pan add milk and bring it to boil , turn to medium heat, while keep stirring periodically (so that milk does not burn from the bottom) till it is thickened or reduced to 70%. Once milk become little thicker add saffron, sautéed makhanna and let the makhanas and milk simmer for 20 to 25 minutes on low heat or until milk reduce to half and of acreamy consistency, stirring frequently. Once makhannas become soft and milk become thick and creamy add sugar, and sliced nuts, mix and cook for another couple of minutes. Turn the stove off. Transfer the kheer in a serving bowl and sprinkle other half of nuts. Serve the makhana kheer hot or cold. Lotus seeds, commonly known as makhana in India, are the seeds of the water lotus plant. The seeds are small, round and white or off-white in appearance. They are the edible seeds of lotus flower which can be roasted or fried. Lotus seeds are used for nutritional and healing properties in Chinese medicine. The lotus seeds are highly useful in terms of nutritional benefits and are low in saturated fats, sodium and cholesterol; high in magnesium potassium, thiamine and phosphorus. Besides being edible, the lotus plant has many health and beauty benefits as well. You can use makhana seeds in desserts, rice porridge, soups and stir fry dishes. Lotus seeds are also a good source of protein, iron and zinc, which makes them extremely nutritious. They contain the anti-aging enzyme, which assist repair damaged proteins. Due to this anti-aging propery, many cosmetic companies are trying to include the seeds in their products. Along with it, the seeds have a natural flavonoid which prevents inflammation. Lotus seeds have an astringent property which benefits the kidneys and helps to restore vital energy within the body. The sweet and neutral taste of makhana seeds nourish the spleen and alleviate diarrhea. Makhana seeds are endowed with sedative properties and are used to treat insomnia or restlessness. The lotus embryo is useful for heart because of its bitter and cooling properties. Also it can help dilate blood vessels, thus reducing blood pressure. According to western research, the seeds are antiviral which help fight the herpes 1 virus. Also it has been founded useful in lowering hypertension. One of the vital medicinal benefits of lotus seeds is stopping chronic diarrhea. Due to astringent properties, the seeds are consumed to help relieve the symptoms of diarrhea and improve appetite. Other major benefits of lotus seeds include palpitations, insomnia and irritability. They are also used to control bleeding. Since makhana seeds are high in fiber, it helps to avoid constipation. Also they help the body to remove the waste; prevent the accumulation of toxins. Lotus seeds are low in calories, fat and high in fiber and thus helpful in diabetes. It lowers the blood sugar level. The seeds are recommended for women during pregnancy and post natal weakness; helps in female infertility. The makhana seeds are also used in the treatment of arthritis and rheumatic pains. Further, the seeds are beneficial in weight loss too as they are high in fiber and low in calories .Lotus seeds are also very useful in anemia. The lotus seeds can be digested by all age groups. They are a healthy snack for children .Just roast the seeds a bit and add a pinch of salt. Hi friends! Puffed seeds /makhana/Fox nuts are used in kheer, curries, puddings and as a dry-roasted snack. These could be one of the options as healthy all time snacks! In a heavy bottom pan, put the ghee/ oil and when hot add the lotus seed stir fry until crisp over low flame. This takes 5-7minutes. Sprinkle pepper powder, and salt on the hot fried lotus seeds/ Phool makhanas and mix well until the lotus seeds are well coated with salt and pepper. Remove them and keep them aside. Serve them hot at tea time. Cool before storing the fried lotus seeds in an air tight container. Can be stored for a week. If the seeds loose crunchiness, just dry roast them for few minutes again and they will regain crispiness. Lotus seeds are popular for their nutritional benefits and healing properties. They are commonly used in Chinese medications and also in various recipes. Lotus seeds contain L-isoaspartyl methyltransferase, an enzyme with anti-ageing properties. It is known to help in repairing damaged proteins. The seeds contain kaempferol, a flavonoid known for its anti-inflammatory properties. It is known to help in repairing aging gum tissue. The astringent properties of lotus seeds make them beneficial for the kidneys. They help to regulate the energy levels of the body. Some studies indicate that lotus seeds may be used to treat various sexual conditions. Lotus seeds are used in Chinese medicine to relieve the problem of diarrhea. They are also used to improve the health of the spleen. Traditionally, lotus seeds were used to treat people with sleeping disorders such as insomnia. They are also known to be effective in alleviating restlessness. This is due to the natural sedative and calming effects of the seeds. The center of the lotus seed is known to be beneficial for the heart due to its cooling properties. The bitterness of the seeds comes from isoquinoline alkaloids which are believed to induce a calming effect and are also anti-spasmodic in nature. They cause dilation of the blood vessels and thus help in controlling blood pressure levels. Some medicinal researchers believe that lotus seeds help to strengthen the digestive process and relieve diarrhea. The seeds are sometimes combined with other herbs in order to treat urinary ailments such as prostatitis and reproductive diseases. However it is advisable to consult a doctor before using any natural remedies such as lotus seeds. Lotus seeds also contain a powerful anti-aging enzyme which researchers are now trying to add to various anti-ageing products and cosmetics. The dried seed heads are sold for decorative purposes across the world. These seeds are commonly used in dried flower arranging.